“Made in India”- Are you kidding? Everyone scoffed at the sheer audacity of violins being made in India. As far as they were concerned, it was an instrument of western music, and there were places in the world better suited to making such an instrument. This was the exact response I got from a storeowner, who is also a renowned musician, when I visited their store to promote violins made in India. Another storeowner laughed in my face when I proposed that she sell violins made in India. I was aghast that they thought so lowly about a country that is known for its music and culture. I decided to show them how capable we are in producing violins of top quality – I picked up the violin and began to play it. She listened to me play, mesmerized by the quality of its sound. Then she took the violin form me and began to play it herself. It was apparent she had changed her views on a violin ‘made in India’. Soon she invited all of her students to try it and they all played it, one by one. One of the teacher’s commented, “It sounds better than my violin.” That was a proud moment for me; they not only liked the product, but it had changed their view about quality musical instruments being made in our country. It wasn’t long before we got an order from them. Meanwhile, stores from all over India also began stocking our product. It is a euphoric feeling to create quality products that are appreciated by musicians, not only in India, but also around the world. It is a humbling and gratifying feeling when a reputed Indian newspaper, “Economic Times”, recognizes our work and featured us in the article displayed above. It gives us immense pleasure to bring you happiness with our instruments. And in your happiness, is ours. It almost seems like yesterday that we launched MusicStore.in, but almost five years have flown by. In these fleeting years we have had our share of challenges and triumphs, the crests have been euphoric and the troughs have been opportunities to make improvements. Through all of this we are grateful to you, our clients, who have stood by us and supported our store, be it online or our brick and mortar establishment. The business of musical instruments is a tough one and we braved it through the first 2 years, during which we became the first to import, export and manufacture musical instruments – by no means an easy feat. It was our experienced team of musicians and staff that made it all possible. Our popularity rose in a short while, thanks to our clients, and soon we were being featured in established media publications, such as The Outlook Business, The Hindu and Economic Times. Besides our business acumen, the salient feature of our business was putting the customer first above all else. Serving the customer with exact information and assisting them make the right decisions and choices gave us goodwill and recognition. Our passion for music drew us to the business of musical instruments with a mission to make available great products at affordable prices, so that other budding and established musicians can follow their dreams. As part of our strategy, we manufacture and distribute products of premium quality at low prices – an achievement that has impressed other players in the business. 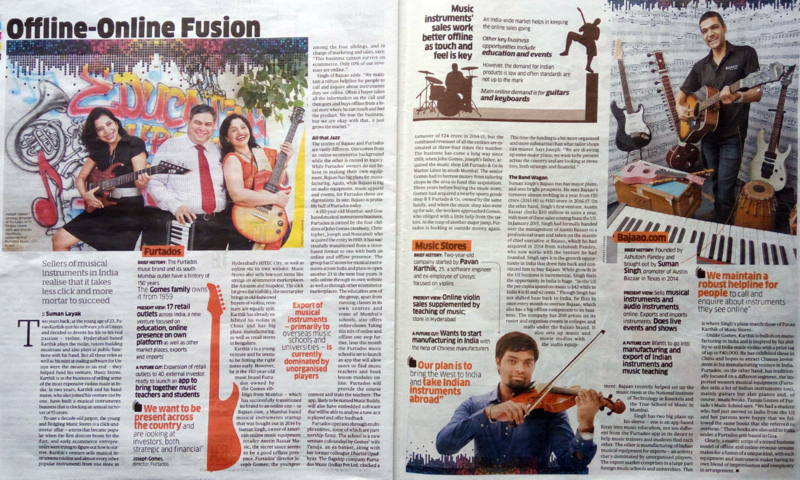 In India, one of the biggest challenges is to make budding musicians aware of the importance of using a great instrument that makes it possible to play great music. 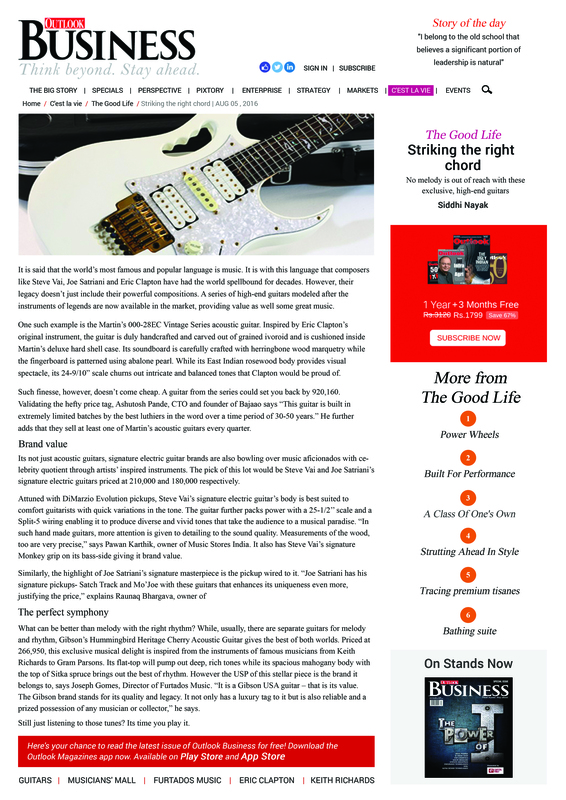 All over the world musicians have the opportunity to explore and exploit their potential through the availability of great instruments capable of producing high quality output. There is also less stress associated with learning on good quality equipment, and beginners learn faster when playing an instrument that is more comfortable. It is our privilege to be there for you and support you through your musical journey, concentrating on improving your skills while you leave the concern of a quality instrument to us. We assure to get you the best musical gear that will support you every step of the way.